China and France called for increased cooperation and signed multibillion-dollar deals on Monday, despite French President Emmanuel Macron’s recent swipe at Beijing’s huge investments in Europe. 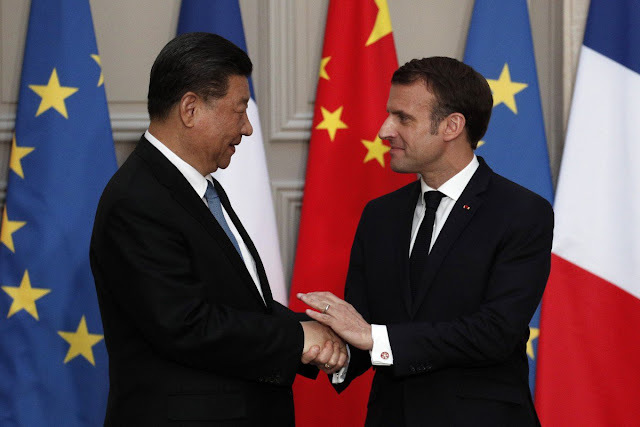 Brushing aside their differences on the controversial “Belt and Road Initiative”, Xi described bilateral ties with France as “sound and stable” and oversaw with Macron the signing of 15 business deals totalling about €40 billion (US$45 billion), including an order for 300 Airbus planes. The larger-than-expected aircraft deal, estimated at €30 billion at catalogue prices, matched an order for 300 Boeing planes when US President Donald Trump visited Beijing in November 2017. Other deals ranged from the renewable energy sector to shipping and banking as well as Beijing’s agreement to lift an embargo on French poultry. A letter of intent on space collaboration was also signed, allowing Paris to send French scientific instruments to China’s lunar mission Chang’e 6 scheduled for around 2023, according to the French space agency CNES. Analysts noted Xi’s visit came as China-EU relations were at a crossroads, with major European countries increasingly vocal against China’s unfair trade policies, investment inroads and unfulfilled reform promises.